Photos of three of the latest Mangos delivered. On Friday evening they were all out in the snow for the first photo before being loaded into vans for delivery to customers. The orange top and white bottom Mango in the middle is the lightest yet produced. It weighs just 30.5 kg including everything (lights and battery etc.). That's light for a velomobile. The owner asked for a minimal setup and lightweight equipment because he wants to race it and I look forward to the result. We've been working on weight reduction for a product that I can't tell you about yet, so this was good practice for us. 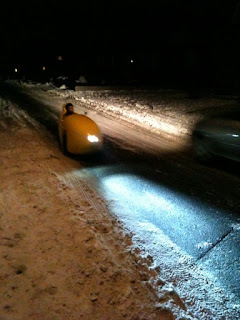 The second photo, taken by Harry in Germany, is of the customer of the yellow Mango taking his first test ride through the snow. I'll be setting off for work in a few minutes myself, riding my yellow Mango through the snow to Groningen. It's -6 C this morning, 5 C warmer than it was when I set off last Friday morning, but still cold. A warming cup of coffee will be very welcome when I arrive, and having found the banana I carried on Friday to be complete solid on the way home when I tried to eat it, I've got a muesli bar today instead. Read my review of the Sinner Mango Velomobile. I do like the look of those velomobiles, and can see how they could be a very practical human powered transport system: but don't you get very hot inside in non-winter conditions - I'm dripping after half an hour on my Trice QNT on the turbo trainer. And how do you secure them when you get to your destination? Sadly one advantage the car has over hpvs is that it is a giant locked box on wheels that's too heavy to pick up and walk away with (or chuck into a convenient white van). David, it looks like it wouldn't be too difficult to add a windshield/cover on the Mango. Have you guys tried implementing something like this? hercule: Riding indoors on a trainer is perhaps the most effective way of building up a sweat on a bicycle. Before getting my own Mango I rode a borrowed one through much of the summer, using it for the commute and for racing. Without the foam cover in place it's really not that bad in the summer. With it, and with too many clothes on, you can overheat even in the current conditions. I wear just two layers while riding the Mango at the moment. As for locking, it's possible to put a D lock through a wheel quite easily and lock it to something. Cars do have many conveniences, and of course that is why they're so popular. James: Some people have made windscreens. I quite like the refreshing wind in my face. Or there are racing hoods which further improve the aerodynamics as seen here. About the locking: Somebody in Germany who rides a Mango velomobile himself has made a lockable lid for the opening of Mango velomobiles. Here is a link to his website (in German): mango-lid. Here is a link to the discussion in the German velomobilforum. I have one of these lids in use myself, and I really like that I can leave stuff in the velomobile, and people cannot easily access the inside. If you also set the parking brake, this makes it difficult to move the vehicle. If you lock a wheel to something stationary, this makes the parked vehicle quite secure. Oh, I forgot to say: you can stow the lid below the "hood" of the Mango velomobile, and easily take it along when you ride. Just ride in speedos and you wont feel so hot. David, I was thinking more for protection from heavy rain/snowstorms. If these were ever to go mainstream as an alternative to the automobile, I would think weather protection would be essential. Agreed that on a regular day you would want to have the wind in your face, however. James, actually the foam cover works very well for what you want. I always leave my Mango outside at work, and while I've watched rain pour down while I work, and have had to scrape snow off it before riding home, I've never found a wet seat waiting for me. There are two parts to the foam cover. The smaller one goes where your head usually is as can be seen in this photo. Both parts store easily inside the Mango. Some people keep their Mangos outdoors all the time. Mum, can we go skating ?